An excellent article in Forbes by Jay D. Adkisson concerns Scientologists Matt and Kathy Feshbach. Adkisson’s article was the feature subject of a recent column Tony Ortega’s Underground Bunker. The community commentary was fascinating. Essentially, the US Bankruptcy Court refused to allow the Fessbach’s to discharge $3.8 million in their Chapter 7 bankruptcy. In her 40 page ruling, US Bankruptcy Judge Catherine McEwen cited both the Fessbach’s refusal to curb their lavish spending and large donations to their church (Scientology) as among the reasons for refusing to discharge their substantial tax debt via bankruptcy. In September 2008, the Fessbach’s made an Offer in Compromise (OIC) to the IRS to settle their 2001 tax debt of $3.6 million for $120,000, this to be made in payments over 48 months. The IRS declined the Fessbach’s unreasonable offer to settle for pennies on the dollar of the amount owed. Note: Hover over the document with your pointer to get the control panel to appear. Keeping Up with Matt Feshbach. More to the point, the Feshbachs could have immediately reduced their tax debt by more than $1 million by simply canceling their personal vacations and giving up the rented house in Aspen. They could have saved a similar amount by dramatically reducing their unreasonable clothing allowance and foregoing charitable giving altogether. These are just a few of the available examples that prove the superficiality of their claimed inability to pay. Like Richie Acunto before them, Matt and Kathy Feshbach become bankrupt Scientologists. Richie Acunto’s $10 million dollar IAS trophy ignominiously wound up for sale on eBay. That money could have helped Acunto rescue his company Survival Insurance. See Tony Ortega’s excellent article The Scientologist who wouldn’t fly: The rise and fall of insurance mogul Richie Acunto. Likewise, the millions the Feshbach’s gave Scientology over the decades could have paid their income tax liability. Matt Feshbach, the one time master of the trading world with his brothers and their “shorting against the box” strategy was ultimately financially ruined because he simply did not pay his income taxes when he had the money to do so. Feshbach claimed changes in the tax code were responsible but the court established that despite these changes Feshbach had the income to pay his tax bill. The US Bankruptcy Court noted that the Feshbach’s could have paid their entire tax debt had they simply curbed their excessive and lavish spending on a luxury lifestyle. The Feshbach’s thought they could ultimately beat the IRS by going bankrupt. However, they lost that bet when the court found that the couple had, “willfully attempted to evade their tax debt within the meaning of 11 U.S.C. § 523(a)(1)(C). Judge Catherine Peek McEwen will enter a separate final judgment in favor of the United States in this proceeding. Matt and Kathy Feshbach will have to pay the $3.8 million in back taxes they owe the IRS. Sometimes, as with the facts in this proceeding, it is tragically foolish to hold firm to a spend-money-to-make-money conviction. The Feshbachs made poor spending decisions, continually leading a life of excess in the face of serious, known financial obstacles. At all times, their primary concern should have been reducing their substantial tax debt. But as their immoderate spending choices show, they were far more focused on living in the lap of luxury. They would have been wise to heed the proverb which cautions that enough is better than too much. As it is, however, the Feshbachs’ misjudgment ultimately cost them complete relief. Having concluded that the Feshbachs willfully attempted to evade their tax debt within the meaning of 11 U.S.C. § 523(a)(1)(C), the Court rules that such debt is nondischargeable. Accordingly, the Court will enter a separate final judgment in favor of the United States in this proceeding. “Enough is better than too much” is a lesson that the rapacious Church of Scientology will never learn. Wanting too much of everything — money, breaking up families, punishing people, using child labor and so many other things — is one of the main reasons why Scientology is collapsing. It is the same behaviour with the Orgs. They never have money and don’t pay taxes while the IAS is rich as rich can be. Hubbard wrote in his scripture that taxes and tax authorities are suppressive. The majority of us who live within our means, pay our taxes, and support our favorite charities still manage to pay our bills! Finally the IRS is taking note of the outrageous decision made regarding Scientologists not being held accountable for their many transgressions. Hopefully this is just the beginning of many judgements and changes needed since so many abuses have come to light the past 5 years. 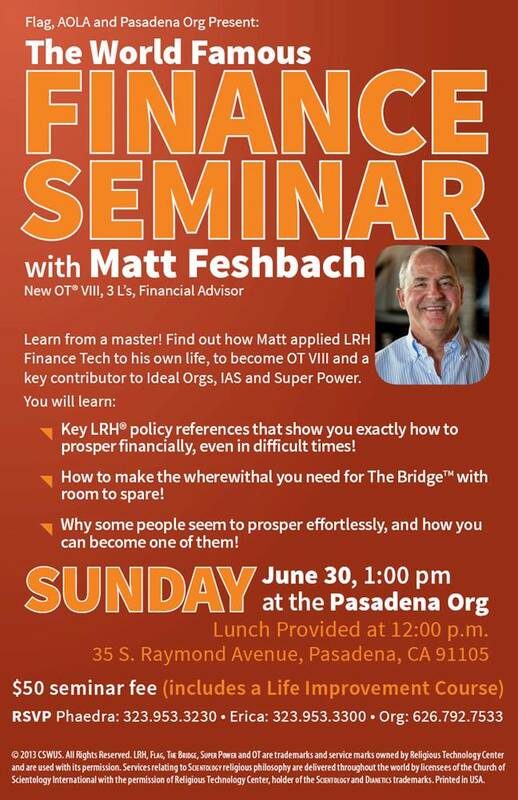 How dare Mr. Feshbach promote himself to others as an example of a Financial genius? This seminar should also be disallowed with a penalty imposed. What balls these shameless charlatans have!